Almost five hundred years after the fact, Roman Catholics still scrutinize Martin Luther. One the most popular quotations from Luther is the infamous "epistle of straw" remark, directed at the canonicity of the book of James. It really is amazing how frequently this citation appears. It is usually brought forth as proof one must believe an infallible church authored an infallible list of infallible books. Without this, one subjectively decides which books are canonical, like Martin Luther supposedly did in the sixteenth century.If you find yourself in dialog facing this quote, there are a few facts and arguments you should know. First, this quote only appears in Luther's original 1522 Preface to the New Testament. After 1522, all the editions of Luther's Bible dropped the "epistle of straw" comment, along with the entire paragraph that placed value judgments on particular biblical books. It was Luther himself who edited these comments out. For anyone to continue to cite Luther's "epistle of straw" comment against him is to do him an injustice. He saw fit to retract the comment. Subsequent citations of this quote should bear this in mind. Second, detractors are keen on selectively quoting Luther's preface to James. Most often cited are only those comments that express negativity. If one takes the times to actually read Luther's comments about James, he praises it and considers it a "good book" "because it sets up no doctrine of men but vigorously promulgates the law of God." Rarely have I seen Luther detractors inform a reader Luther praises James, or respects God's law. On the other hand, I have seen many Catholics insist Luther was either morally corrupt or an antinomian. Luther though insists James is worthy of praise because it puts forth Gods law. Third, Luther does appear to have held lifelong doubts about the canonicity of James, but it wasn't because he was purely subjective as Roman Catholics claim. He did not whimsically dismiss Biblical books simply because he did not like their content. Luther was aware of the disputed authenticity of the book. Eusebius and Jerome both recorded doubts to the apostolicity and canonicity of James. Luther did not consider James to be James the Apostle. He wasn't alone in this. The great humanist Scholar Erasmus likewise questioned the authenticity of James, as did Cardinal Cajetan, one of the leading 16th Century Roman Catholic scholars. "According to Catholic doctrine, the proximate criterion of the Biblical canon is the infallible decision of the Church. This decision was not given until rather late in the history of the Church (at the Council of Trent). Before that time there was some doubt about the canonicity of certain Biblical books, i.e., about their belonging to the canon." Erasmus, Cajetan, and Luther had every right within the Catholic system to engage in Biblical criticism and debate over the extent of the Canon. All expressed some doubt.Their's was not a radical higher criticism. The books they questioned were books that had been questioned by previous generations. None were so extreme as to engage in Marcion-like canon-destruction. Both Erasmus and Luther translated the entirety of Bible, and published it. Finally, Luther says he cannot include James among his chief books "though I would not thereby prevent anyone from including or extolling him as he pleases, for there are otherwise many good sayings in him." These are hardly the words of one claiming to be an infallible authority or a "super-pope" (as one Catholic apologist used to claim). This points out an important flaw in Catholic argumentation. Some actually argue as if we think Luther was an infallible authority. Luther didn't think he was, and I've yet to meet a Protestant who considers him anything more than a sinner saved by grace, imperfect, yet used by God during a crucial period in history. "John Calvin believed in infant baptism which contradicts election"
I want to preface this by saying that I am neither a Calvinist nor an Arminian since I don't follow the teachings of humans, I follow the bible alone. I want to demonstrate what happens when people follow a human and use his name to talk about what God says. John Calvin believed in infant baptism which contradicts election. "Scripture shows, first, that it points to that cleansing from sin which we obtain by the blood of Christ; and, secondly, to the mortification of the flesh, which consists in participation in his death, by which believers are regenerated to newness of life, and thereby to the fellowship of Christ…it is also a symbol to testify our religion to men." This is elementary for anyone who has actually read about Calvin. It is a fact that infant baptism contradicts election along with the fact that even atheists, the Mafia and the Nazis were baptized as infants. So continuing to support Calvin is continuing to OPPOSE FACTS and DENY TRUTH. An ironic aspect of this person's Calvin diatribe is that for something entitled, "Calvin's Beliefs," only one actual quote from John Calvin was provided (cited above). 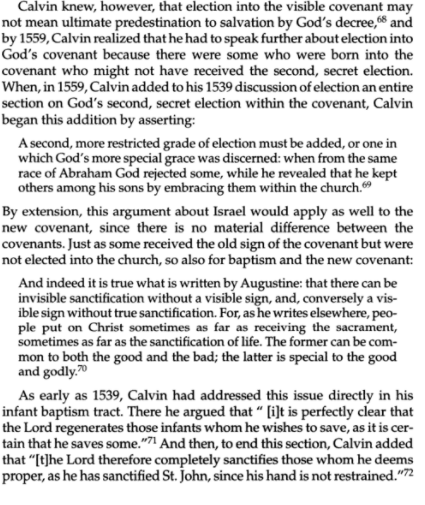 Let's take a look at the sole shred of proof offered and see if Calvin's view of infant baptism contradicted his view of election and if he really was a "fruitcake." Scripture shows, first, that it points to that cleansing from sin which we obtain by the blood of Christ; and, secondly, to the mortification of the flesh, which consists in participation in his death, by which believers are regenerated to newness of life, and thereby to the fellowship of Christ…it is also a symbol to testify our religion to men. John Calvin, Institutes of the Christian Religion (Michigan: WM. B. Eerdmans Publishing Company, 1989). 529. The version of The Institutes being cited is a one-volume edition published in 1989 of Henry Beveridge's translation of the 1537 Institutes. Beveridge's translation was originally released in 1846. what's being cited is Book IV, 16, 2. 2. In the first place, then, [infant baptism] is a well-known doctrine, and one as to which all the pious are agreed,—that the right consideration of signs does not lie merely in the outward ceremonies, but depends chiefly on the promise and the spiritual mysteries, to typify which the ceremonies themselves are appointed. He, therefore, who would thoroughly understand the effect of baptism—its object and true character—must not stop short at the element and corporeal object. but look forward to the divine promises which are therein offered to us, and rise to the internal secrets which are therein represented. He who understands these has reached the solid truth, and, so to speak, the whole substance of baptism, and will thence perceive the nature and use of outward sprinkling. On the other hand, he who passes them by in contempt, and keeps his thoughts entirely fixed on the visible ceremony, will neither understand the force, nor the proper nature of baptism, nor comprehend what is meant, or what end is gained by the use of water. This is confirmed by passages of Scripture too numerous and too clear to make it necessary here to discuss them more at length. It remains, therefore, to inquire into the nature and efficacy of baptism, as evinced by the promises therein given. Scripture shows, first, that it points to that cleansing from sin which we obtain by the blood of Christ; and, secondly, to the mortification of the flesh which consists in participation in his death, by which believers are regenerated to newness of life, and thereby to the fellowship of Christ. To these general heads may be referred all that the Scriptures teach concerning baptism, with this addition, that it is also a symbol to testify our religion to men. Now, it is clear how false is the teaching, long propagated by some and still persisted in by others, that through baptism we are released and made exempt from original sin, and from the corruption that descended from Adam into all his posterity; and are restored into that same righteousness and purity of nature which Adam would have obtained if he had remained upright as he was first created. For teachers of this type never understood what original sin, what original righteousness, or what the grace of baptism was (Institutes IV: 15:10). For although infants, at the moment when they were circumcised, did not comprehend what the sign meant, still they were truly circumcised for the mortification of their corrupt and polluted nature—a mortification at which they afterwards aspired when adults. In fine, the objection is easily disposed of by the tact, that children are baptised for future repentance and faith. Though these are not yet formed in them, yet the seed of both lies hid in them by the secret operation of the Spirit. [IV, 16, 20]. 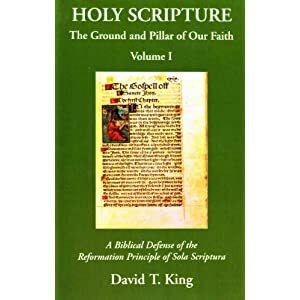 Riggs goes on to examine the "seed" issue noting some of the logical problems produced by Calvin's use of the term, It: "implies a nonpersonal divine activity that guarantees a result, such as planting a seed in the earth. When the gardener plants, the ground cannot refuse." Analogies fall apart when pressed too far. Which is the correct way to understand the analogy: a divine seed must harvest, or a divine seed only sprouts when watered by the irresistible grace of the Holy Spirit? Riggs holds the former. Calvin appears to hold the later. Some years back I was given the honor of contributing entries to James White's Alpha and Omega Ministries web site. Here's an entry I put together in regard to Calvin and baptismal regeneration: Calvin Said What? What hog wash you have continually used weasel words and your Opinion to deny everything. I'd like to look at this quote to see if it's "something else" I'm going to "deny," or it it's something else entirely different. Let's see if this quote proves Luther was a "a demon possessed wicked butcher" or "responsible for the death of untold thousands." Even though two references are given, a simple search reveals this was probably a cut-and-paste from other online sources. The Catholic Apologetics Network uses this quote and documentation verbatim in an article entitled, "The Myth Of Martin Luther And Why So Few Read His Works." The quote can be found with simply a reference to O'Hare in web pages like Shocking Beliefs of Martin Luther. Dr. Michael Brown included it in his book, Authentic Fire. He documents it by saying, "For the quotes on a Christian website critical of Luther see http://www.jesus-is-savior.com/False%20Religions/Lutherans/truth_about_martin_luther.htm." This happens to be the same article posted by the Catholic Apologetics Network. 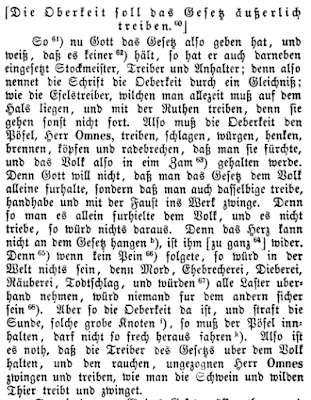 Luther's advice "to strangle" the peasants, "to stab them secretly and openly, as they can, as one would kill a mad dog," was fulfilled to the letter. He thought that "God gave rulers not a fox's tail, but a sword," and "the severity and rigor of the sword," he says, "are as necessary for the people as eating and drinking, yes, as life itself." The time in his estimation had come "to control the populace with a strong hand" and the rulers must resort to "the severity and rigor of the sword." "Like the mules," he says, "who will not move unless you perpetually whip them with rods, so the civil powers must drive the common people, whip, choke, hang, burn, behead and torture them, that they may learn to fear the powers that be. The coarse, illiterate Mr. Great I am—the people—must be forced, driven as one forces and drives swine and wild animals." (El. ed. 15, 276.) This is a most astounding utterance, but apart from its heartlessness and lack of consideration of the common people it shows the way Luther preached liberty and democracy, a liberty and democracy which meant absolutism and despotism armed with all its iron terrors in government and through which for nearly two centuries after the nations of Europe were oppressed and tyrannized. An English translation of this sermon is available in Joel Baseley, The Festival Sermons of Martin Luther (Michigan: Mark V Publications, 2005) pp. 244-258: "A Second Sermon on the Festival of the Presentation of the Infant Christ at the Temple." I've covered this quote previously, though it was a different English translation: Luther: Rulers should drive, beat, choke, hang, burn, behead, and break upon the well of the vulgar masses. What follows was primarily taken from this older blog article. According to the outward mask we sure keep the law, put on a good show and grab hold of it with our fist. But of hearts shy away from it. We do it unwillingly. We have no desire to do by nature unless that Holy Ghost enlightens our heart with His grace. Therefore even if we keep the law with works, yet it is not done from pure and clean heart. For it is done for the sake of our own advantage reputation or out of fear of punishment. Now since God has also given the law and He knows that no one keeps it, He is also the One who has made it a prison guard, driver and leash. For the Scripture designates this supervision [of the law] by comparing it to one who drives a stubborn mule, which one must always push and pull and drive with a stick or it will not move forward. So this supervision of the law must pummel you. It is always to drive, strike, throttle, hang, burn, behead, and torture you so that you fear. By this people are held in check. For God does not desire that the law merely be presented to the people, but rather that it also drive them, seize them with a fist and compel them to work. For only in this way are people preserved. If they are not forced then they will do nothing. That is because the heart cannot keep the law because it is completely against its nature. So if there were no punishment in the world, there would be nothing in the world but the rule of death, adultery, thievery, robbery, manslaughter and every blasphemy. No one would be safe from one another. But when the supervision of the law is there and punishes gross scoundrels and blasphemers, the rabble must be contained by it. They will know they are not permitted to go forth so boldly and live their lives according to their own desires. So it is necessary that the driving of the law remains over people and those raging rebels. It always compels and drives as swine and wild animals are forced and driven. So now if we must do the law and not like it, then we are an enemy of the law for it battles our lusts. But God has done all of this so that it makes us weary. By this we might learn to acknowledge our abilities, and what we are able to do. So we look at ourselves and say, "I, poor man, I must keep the law and I don't like to do it. Yes, I have absolutely no desire to do it. So then I must lose any reward and thanks that I would get for doing it, had I truly and gladly kept the law." In summary, all who are under the law do it unwillingly. So we are tortured by it, forced to keep it and yet earn no reward from it [Baseley, 248-249]. You must know that since the beginning of the world a wise prince is a mighty rare bird,﻿﻿ and an upright prince even rarer.﻿﻿ They are generally the biggest fools or the worst scoundrels on earth; therefore, one must constantly expect the worst from them and look for little good, especially in divine matters which concern the salvation of souls. They are God’s executioners﻿﻿ and hangmen; his divine wrath uses them to punish the wicked and to maintain outward peace. Our God is a great lord and ruler; this is why he must also have such noble, highborn, and rich hangmen and constables. He desires that everyone shall copiously accord them riches, honor, and fear in abundance. It pleases his divine will that we call his hangmen gracious lords, fall at their feet, and be subject to them in all humility, so long as they do not ply their trade too far and try to become shepherds instead of hangmen [LW 45:113]. Streets must be be kept clean, peace established in cities, and justice administered in the land. Therefore one must let the sword strike transgressors vigorously and boldly, as St. Paul teaches (Rom. 13:4). For God wants non-Christians held in check to keep them from doing wrong or from committing wrong without being punished. Let no one imagine that the world can be governed without the shedding of blood. The temporal sword should and must be red and bloodstained, for the world is wicked and is bound to be so. Therefore the sword is God's rod and vengeance for it [ WA 15:302; LW 45:258; Ewald Plass, What Luther Says, III: 1156]. In the sermon in question, Luther goes on to compare fallen humanity's burden of being under the law with Christ who kept the law willingly and with a pure heart. Christ fulfilled the law with pleasure. He volunteered to keep the law. Christ did not fear the stockmeyster. In this 1526 sermon, Luther goes on to weave his exposition of the law into a presentation of the gospel. Luther's theories on government are far more complicated than this simple quote posted on CARM . The interested reader should track down What Luther Says and read the twenty eight page double columned synopsis presented by Ewald Plass. Plass points out a number of factors in Luther's governmental theories, everything from Luther's attitude toward unjust rulers, as well as the fact that rulers should not rely on mere brute force. Not to be forgotten as well, Luther was a not a modern man. His notions of government reflect the collective thinking of his time period. Luther's concern was for a stable society, following Paul's concerns expressed in Romans 13. The simple point being made is that God has instituted government to proclaim and uphold civic law. While the methods suggested by Luther are appalling by today's standards, they weren't so to the sixteenth century person. They were a fact of life. I did post the context of this quote on CARM. The response I received back was, "See I knew you would deny it , and poison the well at the same time, and you are getting quicker with your denials." Ah, well... Que Sera, Sera. Over on the CARM boards, a participant with seemingly Anabaptist leanings has been actively posting against John Calvin and Martin Luther. The view being expressed is that Luther was "a demon possessed wicked butcher" (link), and "His actions speak louder than his words, he was responsible for the death of untold thousands." This person put forth a number of Luther quotes, which I suspect were a direct cut-and-paste from a page like this or this. I'd like to look at some of these quotes. Maybe Luther won't be exonerated for each quote (for he was a sinner, and he did make some outrageous statements), but I don't think any of them prove he was a "a demon possessed wicked butcher" or "responsible for the death of untold thousands." Protestant charge: the Roman Catholic Church committed atrocities like the Inquisition. The Roman church was intolerant. Roman Catholic response: There were also Protestant atrocities and also a Protestant "Inquisition." Early Protestants were also intolerant. 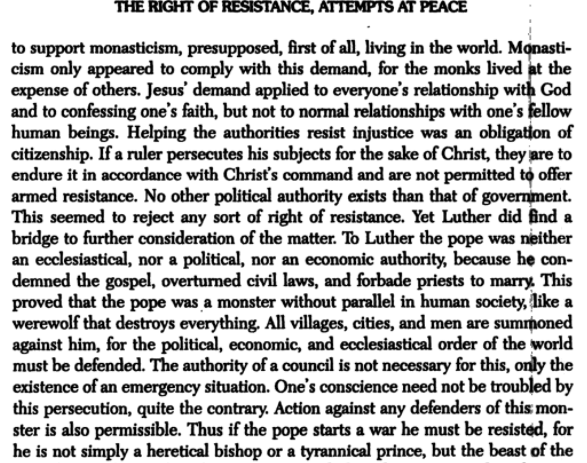 Rome's defenders follow up this argument with a string of evidence of Protestant atrocities (including the Luther quote mentioned above). For instance, Catholic Apologetics Information uses this Luther quote under the subheading "Death and Torture for Catholics and Protestant Dissidents." St Margaret Mary Catholicism 101 uses it under the heading "Protestant Inquisitions" to demonstrate "the early reformers were not into 'freedom of religion' and 'free speech'," as does CatholicBridge.com. While there is a sense in which I'm sympathetic to their overall Tu quoque argument, there's also a sense in which I think much of their proof comes across as propaganda when scrutinized. We'll see with this particular Luther quote that this particular Internet rendering doesn't come from someone actually reading "Martin Luther, Commentary on 82nd Psalm, 1530." Rather, I believe it's been swiped (then edited / truncated) via a hostile secondary source. Then, the corroborating ("cf.") sources show that those using this quote appear to be asleep at the wheel: one of the "cf." sources is bogus, and the other actually says the opposite — that Luther wasn't as intolerant as Rome and he eventually arrived at a position of religious tolerance. Then we'll see that the context does not show the blatant intolerance suggested. Rather, Luther has a specific focus of intolerance for radical teachers and leaders causing societal unrest. Different from most of the other quotes used thus far in this series, this one is treated with a number of references. It appears to me that the quote was truncated / edited using the first of the secondary sources mentioned (Janssen), not a direct reading of Luther. First though, let's look at the corroborating ("cf.") sources, for they reveal that when the quote is used with this documentation, it's a strong indicator that Grisar and Durant were not checked for accuracy, but were simply cut-and-pasted. Here is Grisar, VI, 26-27 (a Roman Catholic source). There is nothing remotely related to this quote on pages 26-27 in volume VI. Grisar's discussion is on an entirely different subject (school curriculum, school issues). I checked pages 26-27 in the other 5 volumes from Grisar, and no discussion of the quote occurs on those two pages. Yes, Grisar does mention this quote in his massive biography of Luther (at least once), but it certainly was not in volume VI on pages 26-27. Here is Durant, 423 (a secular source). Will Durant only mentions the quote briefly. "In 1530, in his commentary on the Eighty-second Psalm, he advised governments to put to death all heretics who preached sedition or against private property, and 'those who teach against a manifest article of the faith... like the articles children learn in the creed, as for example, if anyone should teach that Christ was not God but a mere man.'" Durant's treatment of the quote is merely one sentence, which makes one wonder why the person who originally cited Durant included him as a reference. It's a ridiculous reference, reminiscent of a high school paper. But beyond this silliness, Roman Catholics who use this Durant reference for their Tu quoque argument should read what Durant says previous to this sentence on page 423: "Despite the violence of Luther's speech he never rivaled the severity of the Church in dealing with dissent; but he proceeded, within the area and limits of his power, to silence it as peaceably as he could." And also after the sentence on page 423, Durant states: "We should note, however, that toward the end of his life Luther returned to his early feelings for toleration. In his last sermon he advised abandonment of all attempts to destroy heresy by force; Catholics and Anabaptists must be borne with patiently till the Last Judgment, when Christ will take care of them." I think Durant isn't quite right in his overall assessment, but this is beside the point: Rome's defenders have told us that Durant is a source of proof for their argument. Durant though says something quite different about Luther. Why would Rome's defenders send us to a source against their own Tu quoque argument? One can see how this footnote from Janssen was sifted through to create the quote in question. Janssen though did a similar thing: he sifted and truncated his quote from eight pages of text (also noted in the popular Internet documentation, "EA, Bd. 39, 250-258"). Here is EA 39 page 250. Luther's comments on Psalm 82 have been translated into English in LW 13. Let's work through these multiple pages of LW 13 and look at what Luther stated. A question arises in connection with these three verses. Since the gods, or rulers, beside their other virtues, are to advance God’s Word and its preachers, are they also to put down opposing doctrines or heresies, since no one can be forced to believe? The answer to this question is as follows: First, some heretics are seditious and teach openly that no rulers are to be tolerated; that no Christian may occupy a position of rulership; that no one ought to have property of his own but should run away from wife and child and leave house and home; or that all property shall be held in common. These teachers are immediately, and without doubt, to be punished by the rulers, as men who are resisting temporal law and government (Rom. 13:1, 2). They are not heretics only but rebels, who are attacking the rulers and their government, just as a thief attacks another’s goods, a murderer another’s body, an adulterer another’s wife; and this is not to be tolerated. By this procedure no one is compelled to believe, for he can still believe what he will; but he is forbidden to teach and to blaspheme. For by so doing he would take from God and the Christians their doctrine and word, and he would do them this injury under their own protection and by means of the things all have in common. Let him go to some place where there are no Christians. For, as I have often said: He who makes a living from the citizens ought to keep the law of the city, and not defame and revile it; or else he ought to get out (LW 13:60-62). This is the first part of the quote (it occurs on page 60). First, In context, Luther is writing specifically about those who teach severe false doctrines. This is not immediately clear in the Internet version of the quote because it's surrounded by other quotes and is found often under the heading "Intolerance of Other Christians" or "Death and Torture for Catholics, Protestant Dissidents, and Jews." Second, in context, Luther allows that those teachers "can still believe what he will," but cannot actively teach. This tolerating aspect is entirely left out of the Internet version of the quote! Notice Luther's warning against these teachers is not blatant intolerance across the board. He states they can be heard in society if "they bring good evidence that they are called and commanded by God to do this work in that special place." This is yet another aspect of tolerance left out of the Internet version of this quote. Those though that enter a community and simply demand an audience are not to be tolerated. Even this aspect of Luther's alleged "intolerance" amounts to a desire to keep peace and order in a community. In the background of Luther's concern were the extreme radicals like Thomas Müntzer (named by Luther in the same context, LW 13:64). Luther's "intolerance" in this aspect of the quote isn't a sweeping generalization, but has at its center the radicals causing societal unrest. Certainly there are aspects of the quote in which Luther expresses intolerance, but it isn't to the extreme that is suggested by the truncated version of the quote. In context, Luther's primarily concerned with teaching / preaching radicals that cause societal unrest, but even in his intolerance of them, he would rather they be banished: "But if they went or stayed where there are no Christians, and where, like the Jews, they would be heard by no one, then we would have to let them blaspheme to the stones and trees in some forest, or possibly in the depths of the sea, or in a hot oven" (LW 13:67). If though they insist on teaching, they should be given over to the authorities. As I stated above, there is a sense in which I'm sympathetic to the defenders of Rome who put forth the Tu quoque argument that Protestants have also committed atrocities, so bringing up Rome's past sins isn't a logically compelling argument against her . This is why I rarely have written against Rome by pointing out her moral evils. On the other hand, some of Rome's defenders have a habit of making Luther worse than he was: by presenting truncated quotes devoid of context, accompanied by spurious documentation. This I am not sympathetic to. It is the way of propaganda. I am not sympathetic to such methodology, at all. We'll see below that finding the context for this specific quote is no easy task. The person using it simply cut-and-pasted it, and I'm confident that if challenged, that person could not provide a meaningful context. The documentation provided is "Daniel-Rops, 86." "Daniel-Rops" is not a writing of Luther's. It refers to page 86 in the second volume of The Protestant Reformation by Henri Daniel-Rops (1901-1965). He was a French Roman Catholic writer. The chapter which houses this quote is entitled, "The Tragedy of Martin Luther." As the title infers, the author takes a negative view. For instance, even though Luther deserves "fraternal pity," Luther's mind "contained also something of the devil" (p.356). He "turned to rebellion of the worst kind." While there were "many in the Catholic camp" that contributed to the woes of the Reformation, "Nevertheless it remains true to say that the greatest guilt was Luther's" (p. 356). Henri Daniel-Rops sees Luther as a necessary evil, a heretic that provoked the Roman church to "genuine reformation" (p.356-357). 28. — Luther writes against the Sacramentarians, and why he treated Zuinglius more severely than the rest. It provoked Luther to see, not only individuals, but whole churches of the new reformation, now rise up against him. But he abated nothing of his accustomed pride. We may judge from these words, — "I have the Pope in front; I have the Sacramentarians and Anabaptists in my rear; but I will march out alone against them all; I will defy, them to battle; I will trample them under my feet." And a little after, — "I will say it without vanity, that for these thousand years the Scripture has never been so thoroughly purged, nor so well explained, nor better understood, than at this time it is by me*." He wrote' these words in 1525, a little after the contest had commenced. * Ad Maled. Reg . Ang. t. ii. 493. Boussuet does provide a reference, "Ad Maled. Reg . Ang. t. ii. 493." This refers to a writing Luther made to King Henry. In Latin, it has been cited a number of ways: "Ad maledictum regum angliœ, resp.," "Responsio ad maledictum Regem angliœ," "Regis Angliae responsio ad Martini Lutheri epistolam," "Invictissimi principis Henrici VIII., regis Angliae et Franciae, ad Martini Lutheri epistolam responsio," etc. 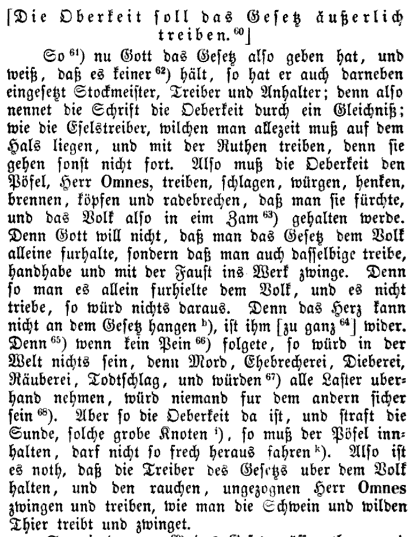 (In German, the title is "Auf des Königs von England Lästerschrift Titel. M. Luthers Antwort," Answer to the King of England's slanderous book (1527) (which is found in WA 23:26-37 and is scheduled to be translated in a future English volume of Luther's Works). "t. ii. 493" refers to the Wittenberg Edition of Luther's Works. This would have been the edition Boussuet had access to in his historical period. "ii. 493" refers to the second volume, page 493. Notice the line, "Papistae in frontem aciem dirigite, a tergo intuadant Sacramentarii, Anabaptistae." That's verbatim for the quote in question. I think it's safe to say that the quote was taken from this treatise. The "thousand years" quote is on page 498 (intra annos mille). When Luther said, "I am on the heels of the Sacramentaries and the Anabaptists; ... I shall challenge them to fight; and I shall trample them all underfoot," it appears that some people think through these words he advocated violence towards them. What the words appear though to be are rhetoric in regard to the theological and political battles Luther was engaged in. This is one of those mystery quotes that's circulated the Internet for years. I would classify it as pure propaganda: it's devoid of any sort of meaningful context, and the documentation is far from useful if one wanted to read the quote in its context. The Internet version of the quote is typically used as an example to prove something about Luther other than what the original context or historical situation intended. For instance, on this old Catholic Answers discussion thread, the quote is used to demonstrate, "Luther on Protestant 'Heretics'." Similarly, Catholic Apologetics Information uses it for the same purpose under the overarching title, "The Protestant Inquisition 'Reformation'." This web page uses it to describe Luther's "Intolerance of Other Christians." This Mennonite blogger uses it to demonstrate, "Martin Luther, the often-cited Christian hero who condemned the corrupt practices of the state church of his time, was certainly not viewed as a Christian hero by the Anabaptists he persecuted." All of these web pages have one thing in common: none of them ever bothered to actually look the quote up, but rather use it for whatever their particular agenda demands. Typical of the Internet, this quote is often used without any documentation. When it is documented (as it was on CARM), one particular string of references reoccurs: "Grisar, VI, 245; EN, IV, 298." We'll see that none of these references are actually to a writing from Luther. Then, we'll see that the quote isn't exactly a quote from Luther. Rather, it's someone's summary statement of what Luther meant. "Grisar, VI, 245" is not a writing from Luther. It refers to the sixth volume in a lengthy biography of Luther by Roman Catholic historian Hartmann Grisar. The heading Grisar used for which he placed the quote is entitled, "Luther's Intolerance." The picture Grisar paints of Luther is that of a man who expressed religious toleration early in his career (when his views were under attack), and intolerance later (when he achieved notoriety and was part of the political establishment). In regard to the CARM participant's heading, "intolerance of other Christians," Luther did not consider the pope to be a Christian, but rather the Antichrist. (5) Above, vol. ii., p.311, and present vol., p. 240, n.1. (6) Ib., vol. ii., p. 318. (1) Above, vol. iv., p. 298. The mystery of the documentation is "EN, IV, 298." If you look carefully at the documentation on page 245, "IV, 298" is supposed to refer to the fourth volume page 298 in Grisar's biography of Luther. I'm not exactly sure what "EN" refers to. It may refer to a collection of Luther's letters put together by Dr. E.L. Enders in the nineteenth century. If this is what is meant, Grisar's documentation was misread. Yes, there are some letters cited on page 245, but the particular quote in question is not from a letter, nor does Grisar say it is. The Disputation, of which all that is known was published by Paul Drews in 1895, dealt principally with the question, which had become a vital one, of armed resistance to the forces of the Empire then intent on vindicating the rights of the Pope. The Theses solve the question in the affirmative. "The Pope is no authority ordained by God ... on the contrary he is a robber, a Bearwolf who gulps down everything. And just as everybody rightly seeks to destroy this monster, so also it is everyone's duty to suppress the Pope by force, indeed, penance must be done by those who neglect it. If anyone is killed in defending a wild beast it is his own fault. In the same way it is not wrong to offer resistance to those who defend the Pope, even should they be Princes or Emperors." The points for which Drews' summary statements are based are from Luther's Circular disputation on the right of resistance against the Emperor (1539), and can be found at WA 39.2:42-43. To my knowledge, this Disputation has not been translated into English, but will be included in a forthcoming edition of Luther's Works.